Whether it’s for freedom, adventure, spiritual experience, confidence, independence, or community, women are taking to motorcycles with an increased voracity. Three years ago, Debra Teplitz, 44, decided to silence the voice in her head that said, “Nice Jewish girls from the North Shore of Chicago don’t ride motorcycles.” Like so many women who are learning to ride in their 30s, 40s, 50s, and beyond, Debra has confronted personal challenges, societal stereotypes, and cultural expectations to embrace the freedom and independence of motorcycling. For many female riders, mastering a motorcycle has served as a catalyst for other long-awaited life changes. While their riding is at an all-time high, women on motorcycles are nothing new. We’ve been riding longer than we’ve been voting. Nonetheless, there are a lot more of us now. 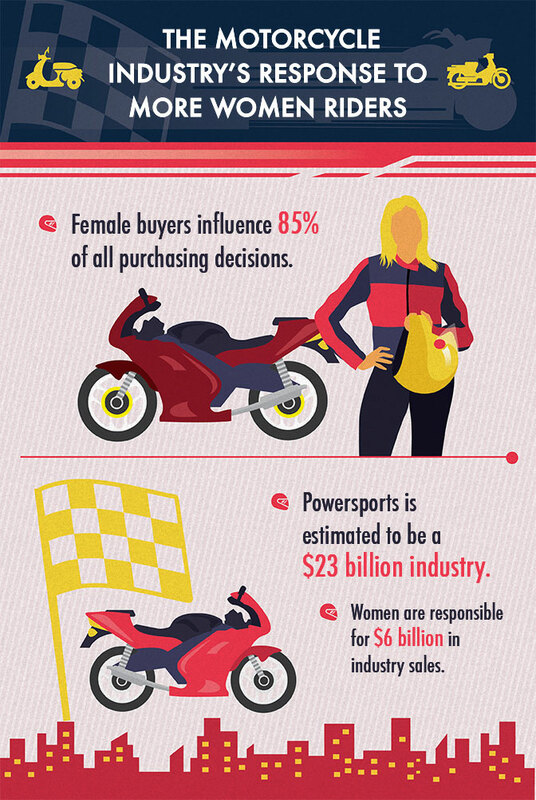 Women are one of the fastest growing demographics in the powersports industry. After her divorce in 2007, Wendy Lamparelli, 51, was ready to buy a bike to fulfill a lifelong dream. Fearing for her safety, Wendy’s mom and kids begged her not to, so she ended up with a convertible instead. But the dream didn’t fade. In June 2012, she made it come true. What does she enjoy most? “The freedom and the pure adrenaline rush I feel when I’m in control of such a beautiful machine,” she says. Debra, editorial operations manager for a multinational publishing house, loved riding with her dad. Even as a child, she felt free and relished the special time spent with him. Years later, while watching her husband learn to ride, she was bitten by the bug. In spite of being terrified of her klutziness, Debra signed up, too. She recalls being so tense that her body still ached two days after class. In spite of stressing over learning to shift, dropping the bike, and picking up speed, she passed her test on the first try. Now 55, Idaho tourism manager Diane Norton started riding 14 years ago because she wanted the independence and a better view than the back of a helmet. She loves riding through Idaho’s scenic back roads alongside her husband. “It’s my Zen. I’m completely in the moment. There’s no cell phone, music, or email that can take me away from my Zen,” she says. Account manager Kelly Geissler, 46, always wanted to ride but never thought her husband was interested. Kids and careers took precedence and riding remained something for another day. That day finally arrived for both of them four years ago. Kelly hasn’t looked back since – except to check her mirrors. Her excitement and drive hasn’t gone unnoticed. Christine’s 20-year-old daughter thinks her mom is cool to try new things and conquer fears. “I think it’s important for people to know you can do anything, no matter what your age,” she says. While riding is often about independence, riders appreciate the community aspect. “It’s given me a sisterhood with a group of women that has changed my life,” she says. 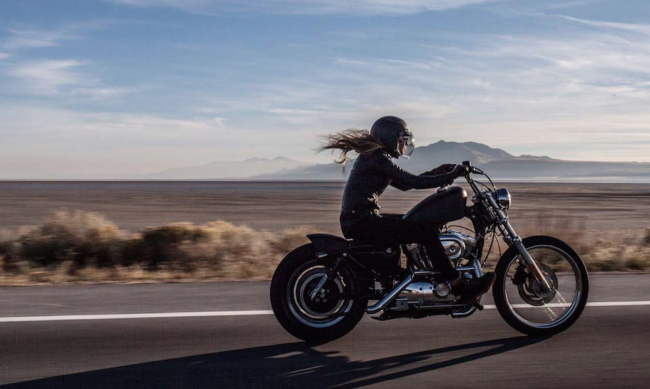 “With women’s affinity toward connection, it’s only natural these riders want to connect with each other,” says Genevieve Schmitt, founder and editor of Women Riders Now, the longest-running and most comprehensive resource for female motorcyclists. “As a result there are hundreds of women’s motorcycle riding clubs across the U.S. and Canada,” she says. These clubs provide an outlet for women to meet up on a regular basis and share their passion for motorcycling. “It’s also a way for new riders to get integrated into a community of like-minded riders,” Genevieve says. One of those organizations is Women On Wheels (WOW). By day, WOW president Cris Baldwin is the assistant dean and registrar for the Sam Fox School of Design & Visual Arts at Washington University in St. Louis. But she devotes most nights and weekends to the not-for-profit organization. WOW has 75 Chapters in the U.S. and approximately 1,500 members worldwide. “This already gives me a network of females not accessible to me prior to WOW,” she says. Most telling of women’s impact on a still male-dominated arena is their entry into leadership positions in the powersports industry. 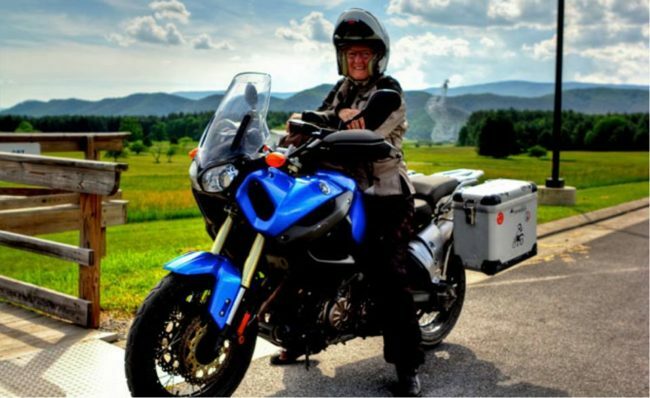 In February 2013, Maggie McNally-Bradshaw, an IT Specialist for New York State, was unanimously elected chair of the American Motorcyclist Association (AMA) board of directors. She is the first woman to lead the AMA board in the association’s 89-year history. McNally-Bradshaw is used to defying the odds. It was her feistiness and pure determination that got her riding at 19. She and a group of friends were talking about dream cars. When 5’1” McNally-Bradshaw said she wanted to get a motorcycle, one of the guys said, “You can’t. Girls don’t ride motorcycles.” She had her permit within a week, and now teaches part-time. Sarah Schilke, Head of Marketing and PR for Schuberth North America and Held USA, became the first woman to serve on the Board of Directors of the Motorcycle Industry Council (MIC) in its 100-year history. An avid street rider and amateur off-road racer, Schilke has been riding motorcycles for 20 years and worked in the motorcycle field for almost as long. Like many women, Cam Arnold – MIC’s VP of Communications – learned how to ride from her college boyfriend. She enjoyed it, and bought a bike, which became her main form of transportation for years. A couple of close calls spooked her and she sold her bike to a friend, whom she later married. She had her bike back! Also typical of many women’s stories, Arnold took a break while focusing on family and career. She and her husband returned to riding once the kids were grown, and don’t plan on stopping any time soon. In a move that’s a huge boost for women riders, PowerLily, a private LinkedIn group for women in the powersports industry (with more than 300 active members), recently became part of the MIC. Arnold will lead the program and work closely with its members to integrate MIC resources. “We’ll have support from all segments of the industry,” she says. Industry leader Harley-Davidson has been pursuing women riders for years, with programs such as the Garage Party, designed to take the intimidation factor out of walking into a motorcycle shop and enabling them to become confident in knowing all aspects of the bike from its frame right down to the motorcycle parts. Their strategy worked. Harley-Davidson sold more new on-road motorcycles to women in the U.S. than all other brands combined in 2013. Perhaps more women have realized the benefits of riding that can extend to daily lives off the road. “Thousands of women have found riding a Harley-Davidson motorcycle is a powerful way to tap into their strength, independence, and confidence and take it to a whole new level,” said Claudia Garber, Director of Market Outreach for Harley-Davidson. Honda has doubled its market share of female riders in the past five years by focusing on a proper fit for women riders. The broad appeal of the CTX700 and CTX700N cruisers with their lower seat height, lower center of gravity, and optional automatic transmission is evident with more than 30 percent of sales to women. Honda has also introduced lower and narrower seats on sport bikes, a move that has helped double the percentage of sales to women in that segment. “I’ve also noticed a shift in more women seeking the adventure style of riding with an eye toward long distance touring on two wheels,” says Genevieve Schmitt. The adventure touring motorcycle market has taken off in recent years; all the new models to choose allow riders more versatility for touring. Women are seeking out this style of riding and enjoying all the rewards that come from venturing outside of a set comfort zone and exploring new horizons, Genevieve explains. Women on motorcycles are powerful. And they’re learning that if you can master your motorcycle, you can master anything. Transformation that begins with one inspires many more who are ready to make a change, with an established community waiting to welcome and provide support. As women riders’ numbers and strength swell, so too does their positive influence, both in the powersports industry and in the organizations in which they work and play. 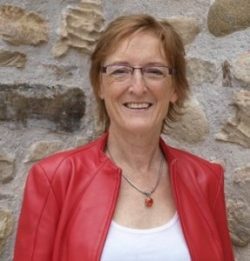 Liz Jansen is a motorcycle enthusiast and a certified motorcycle instructor with the Canada Safety Council. She is the author of “Women, Motorcycles and the Road to Empowerment” and the “Life Lessons from Motorcycles” series. This article was originally posted on Fix.com and shared in its entirely with permission. I am 50….started seriously riding this year because i bought my bike in oct last year. My mother would be having a fit if she was alive 2 c me doing this. Good girls just dont. I rode with my father growing up. It was really the only thing we ever did together. The bike we rode he was going 2 give to me but it was stolen. I have since not been able 2 ride as a passenger so i bought my own and picked something light….low ccs….bright….and narrow to save my hips. I love the outdoors and hiking walking and jogging when i am able. My bike gives the same awe moments out there and my connection with nature. Im not sure how many years i will b able 2 keep riding which saddens me. I should have started 30 years ago.